CAISO transmission planning staff last week proposed studies on the implications of gas shortages on grid reliability. The planners outlined the studies in a June 13 stakeholder call, saying they will consider the risks to Northern California as well as the more vulnerable southern part of the state. The disparity between the regions stems from design differences in their pipeline systems and the synergy between Southern California’s storage facilities and its pipeline network. “Gas storage in the [Los Angeles] Basin is critical [to pipeline operations],” said ISO senior advisor David Le, referring to the gas system’s dependence on the Aliso Canyon storage facility. Le pointed out that the Aliso Canyon — closed earlier this year because of a gas leak — is vital not only for its massive 86 Bcf storage capacity, but also for its ability to quickly supply large volumes of gas to support pipeline pressure. Aliso Canyon usually accounts for more than 65% of the inventory held in Southern California’s four major storage sites. The facility also boasts a daily withdrawal capacity of 1.86 Bcf, which helps keep 17 gas-fired generators in the basin supplied with gas under strained conditions. That withdrawal capability is usually tapped during summer months to help generators meet peak demand. CAISO says that, because of the “magnitude and speed” of the generators’ consumption, pipeline capacity is often insufficient to supply their needs without the ability to backfill from storage such as Aliso Canyon. CAISO plans to model multiple scenarios stemming from the closure of Aliso Canyon to assess the potential long-term impact of the gas system’s balancing act on Southern California’s grid reliability. Planning staff will develop scenarios in which gas pipeline operators and gas generators lose access to other storage facilities in the region in addition to Aliso. The study is intended to take a long view, looking at the implications of such gas curtailments to inform transmission planning for 2021 and 2026 as California advances on its 50% renewables mandate. A parallel study would examine the likelihood for gas curtailments in Northern California, a region with a “much different” gas system, according to Binaya Shrestha, CAISO regional transmission engineer lead. To provide context for his assertion, Shrestha pointed to the February 2011 gas outages that cut supplies to a number of San Diego-area generators. “Southern California is [subject to] historical outages, but in Northern California, there hasn’t been any curtailment of that level for gas-fired plants,” he said. That success can be attributed in part to both the line capacity and topology of the gas system. 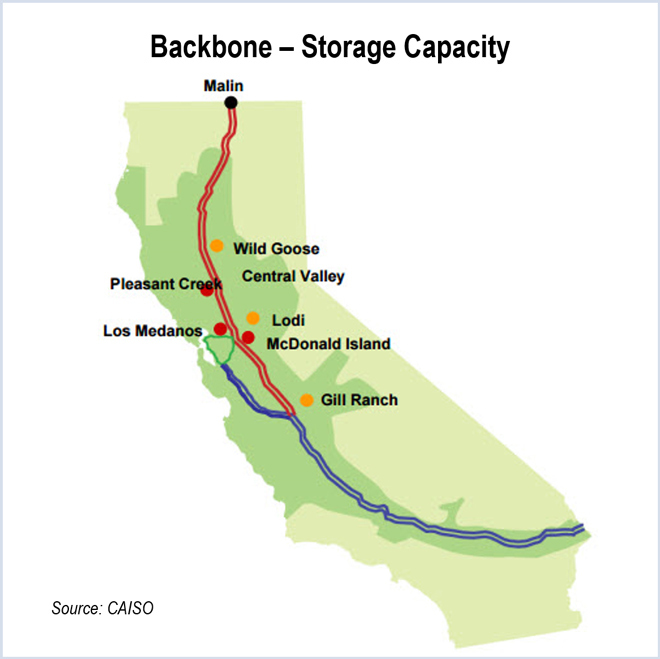 The proximity of gas storage facilities to Northern California’s backbone pipeline provides flexibility for the region’s gas system. The region’s backbone pipeline — Line 401/402 — has a firm capacity of more than 2 Bcfd. Additional supply arrives via the Mojave gas system originating in the southern part of the state, which serves about 2,200 MW of generation in the ISO’s Pacific Gas and Electric zone. Furthermore, nearly all of Northern California’s eight major gas storage facilities are distributed along the length of Line 401/402. That arrangement provides operational flexibility because gas can be injected into the system from multiple sites. Those facilities also equip the region’s gas suppliers with a combined 238 Bcf in inventory capacity — double that in Southern California — and more than 4.5 Bcf in withdrawal capacity. Still, the ISO wants to better understand the dynamics of gas supply in Northern California to investigate what chain of events leading to curtailments could compromise the region’s electric reliability. Stakeholders must submit comments about the gas-electric studies by June 27. Findings will be incorporated into the ISO’s draft transmission plan early next year. California officials cleared the Aliso Canyon natural gas storage facility to resume injections, even as momentum builds to permanently close the site. CAISO’s Board of Governors has approved a proposal to extend most of the temporary Tariff provisions the ISO implemented in June in response to the closure of the Aliso Canyon storage facility.